How beautiful can an album start? Well listen to Why The Sea Is Salt by The Gift and you will know! Gabriele Baldocci's virtuoso Ravel-like piano playing opens At Sea and drags you into the song. The sublime bass lines of Stefan Dickers come in and you float away. Guitar parts (David Lloyd and Leroy James) follow and it starts to rock. Add some synths and Mike Morton's dramatic vocals and you're on your way on an amazing voyage. 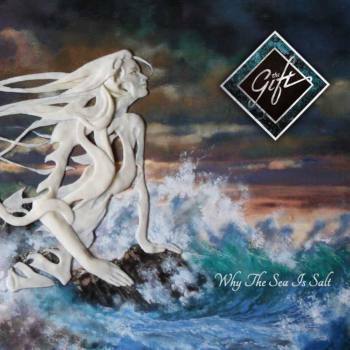 The third album by British band The Gift is a majestic team effort. Finally they play as a whole band and although the first and second album are absolutely great, what the guys do here is fantastic! Yes, a lot has changed. Leroy James, who was heavily involved in the first album, is back and drummer Neil Hayman and Gabriele Baldocci (keyboards) joined. The CD is recorded and mixed by David Lloyd and he did a great job. The sound is perfect. What an album this is. Don't expect simple love song or so, The Gift's lyrics are deep and the music is complex. All the six tracks on this album are special. I wrote already about At Sea, second track Sweeper Of Dreams rocks. Baldocci's synths and piano open Tuesday's Child, and his playing gives this album so much more and lifts the others instrumentalists to higher levels. The song takes more than 10 minutes and still it's over before you know it. That good. Very special is The Tallest Tree. The song opens with Anthony Phillips (the first guitarist of Genesis) on twelve-string guitar and at the end Steve Hackett (also Genesis) closes with a beautiful solo. Both are close friends of the band. Peter Jones of Tiger Moth Tales adds some lovely Irish Whistle playing to the song. Heavy guitars, synthesizers and subtle piano sounds dominate the opening of the epic All These Things. It clock in at more than 20 minutes. Mike Morton is not the usual singer in progressive rock bands. In everything you can hear he is an educated actor. He gives the outstanding lyrics so much more by his passionate and dramatic way of singing. Better than ever in my opinion. At Sea (Ondine's Song) closes this magnificent album. Lovely melodies, emotional, sadness, it all passes. I didn't mention the drumming of Neil Hayman yet, but he's so important to the sound and the drama on the album and in this song. Is this all? No, the artwork that Mark Buckingham made for this album is fantastic. It adds an extra layer of beauty to it. Yes, I'm very moved by this album. I played it over and over again and will keep doing that. I highly recommend it.